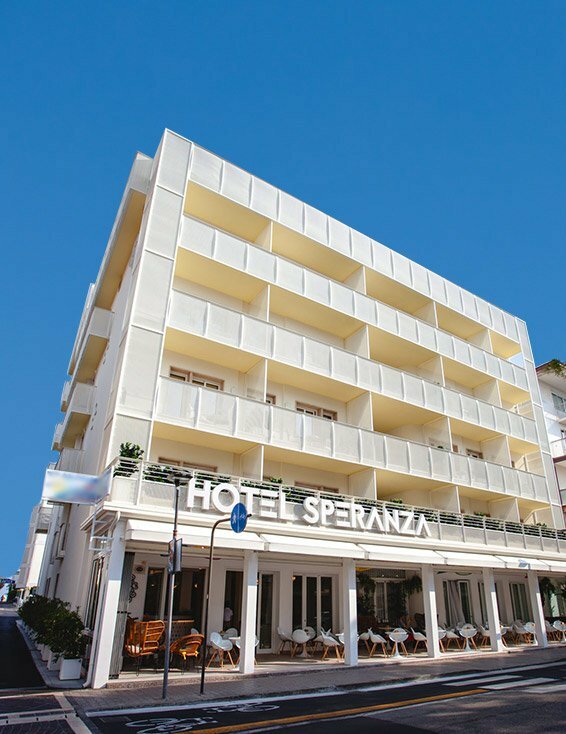 Hotel Speranza, which has been managed personally by the Visentin family from 1972, guarantees guests a pleasant holiday in a welcoming atmosphere. The hotel is situated in the centre of Jesolo, on the long pedestrian precinct of Via Bafile, close to the renowned Piazza Marconi. All the Hotel’s bedrooms are equipped with private bathrooms, air-conditioning and heating, telephone, Wi-Fi, safe and satellite TV. The restaurant serves mouth-watering dishes that vary constantly, accompanied by selected varieties of wine. Just a stone’s throw from the sea, our guests can make use of sun loungers and umbrellas free of charge and take part in the entertainment programme organised by the beach management consortium. The 3 Star Hotel in Jesolo also has a large underground car park where guests can park free.